Spin Dizzy Fall: Goodie Bag Giveaway! Over the past couple of months I have been gathering a fun selection of goodies from event bags and fashion week 2012 just for a giveaway for you guys! Now that this goodie bag is perfect, one of you lucky readers gets to take it all home. 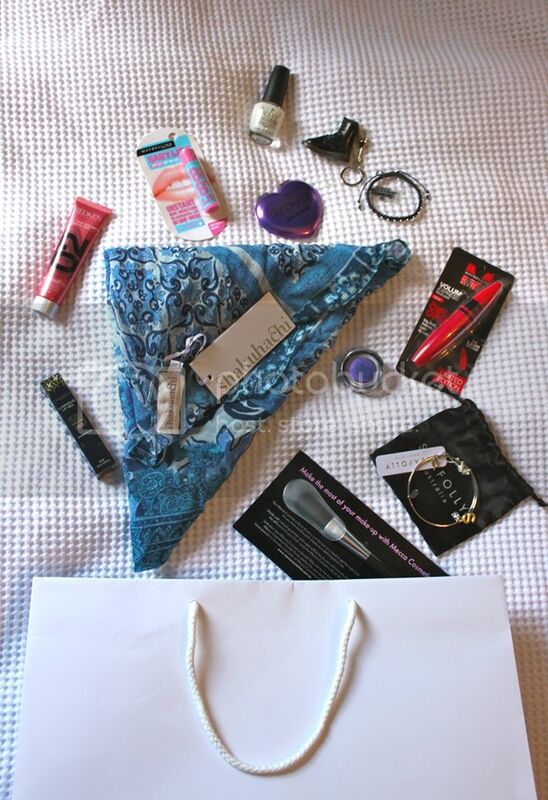 It includes an exclusive shakuhachi silk scarf, OPI polish, Napoleon gloss and a Seafolly charm bracelet just to name a few! This giveaway is being run on the Spin Dizzy Fall Facebook page so pop over (here), like my page and leave a comment saying "I'm a follower!" on this photo on my Facebook timeline to enter! Simple as a sweet sweet pie, guys. Also I've just uploaded my first ever (talking) vlog on my youtube channel which is a bit scary but have a look and let me know if you likey! Would love to win this little goodie bag! That shakuhachi scarf looks INCREDIBLE!